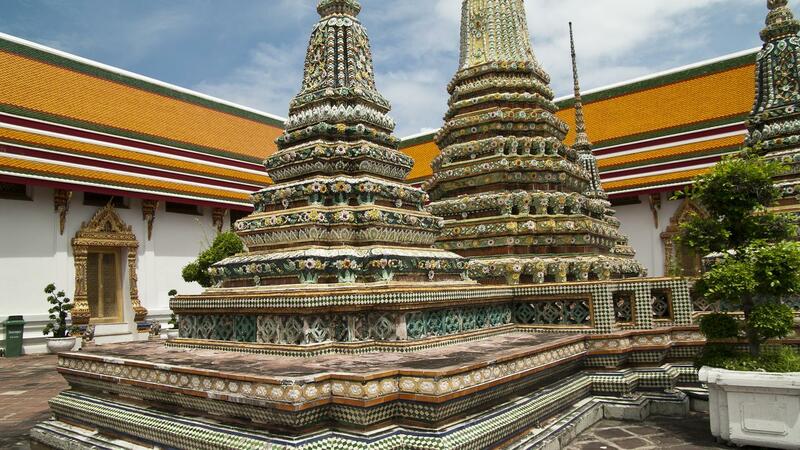 Seek out the laid-back culture and welcoming people of southern Thailand on an eight-day sojourn. Take your time enjoying the hotspots of Koh Samui and Krabi. Stroll the beaches, trek through lush rain forest while staying at an eco-lodge, and snorkel crystalline waters. Whether exploring pristine islands on a private long-tail boat or navigating traditional villages in a tricycle tuk-tuk, experience a side of this popular region that few travellers know. Greater exploration, insider access, and the freedom to roam - all without sacrificing comfort. Your flight must arrive by or before: Arrive at any time. Your flight must depart no earlier than: 15:00 on Day 8. You will be met on arrival at Bangkok Airport and transferred to your hotel. You are welcome to arrive at any time on day 1, but please note that hotel check-in time is 14:00. This is a very laid back trip with lots of free time to enjoy Thailand's beautiful south beaches and jungles or choose to take some optional activities. Below is an example of the hotel we may use in this city. For the actual hotel your specific departure will be using, please check your voucher or the G Adventures App. Catch a flight to the tropical island of Koh Samui. Settle in at the resort hotel and relax at the pool bar or opt to visit the beach or town. Lying off of Thailand’s east coast in the Gulf of Thailand, Koh Samui offers everything you could possibly want in a seaside retreat: white sandy beaches, coconut palms, fresh seafood, and warm, clear waters. Our hotel is located at the vibrant and exciting "Chaweng" district, walking distance to restaurants, entertainment spots and shopping. Catch a tuk tuk to the various beaches close tour our hotel. Kick back and relax on the beach, or opt to explore the town. Embark on a private traditional longtail boat and travel off the tourist trail to the pristine islands of Koh Madsum and Koh Tan. Savour a local lunch on the beach and opt for included kayaking and snorkelling experiences. Transfer by traditional longtail boat to Koh Madsum and enjoy morning kayaking along the stunning coastline. Return to the beach for a delicious buffet lunch. Afterwards, stretch out on a deck chair or, for the more active, head out on a sea kayak, go snorkelling, or explore this magnificent island. Later, continue to Koh Tan for more island activities. Enjoy an excursion by private longtail boat to the secluded beaches of Koh Madsum and Koh Tan. Relax in paradise, enjoying the white sand beaches, turquoise waters and feast on a traditional Thai lunch. Get as active as you please with included sea kayaking and snorkelling off shore. 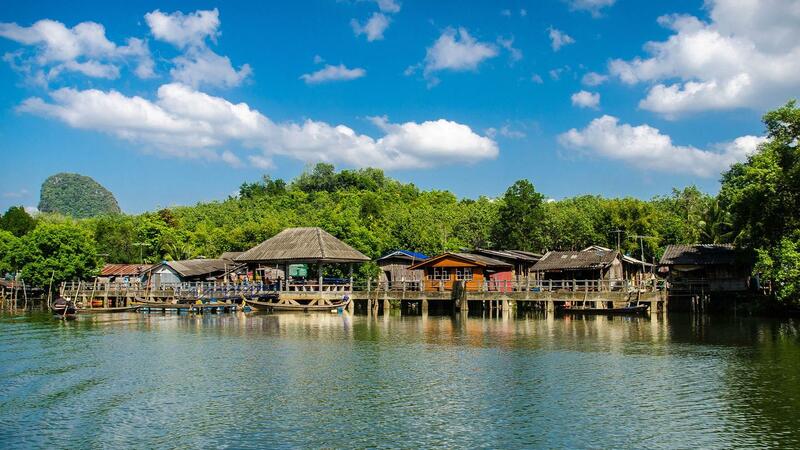 Catch the ferry back to the mainland and drive to Anurak Community Lodge, located just outside Khao Sok National Park. Surrounded by lush rainforest, the lodge focuses on environmental sustainability and working with the local community. This evening, we take a rainforest walk with a community guide and enjoy a campfire dinner under the canopy. Explore the incredibly lush rainforest of Klong Phanom National Park alongside one of the locals who call this region home. This expert tracker is a conservationist and ecotourism guide who is now dedicating his life to the protection of the rainforest. He’ll also discuss traditional jungle medicines and their role in the lives of the area’s people. Afterward, sit down with our host at a campfire dinner of rainforest specialties. Today is free for optional activities including jungle hikes, canoeing, or hot springs. Relax in hot pools fed directly from a local spring. Enjoy the soothing waters and stunning view of the surrounding jungle valley. Explore the National Park with an expert local guide. Hike through stunning rainforest and keep an eye open for birds and monkeys. Enjoy a self-guided hike along the jungle trails surrounding the lodge. Enjoy a guided cycling tour through the local villages surrounding the National Park. Take a guided canoe tour along the Sok river. Enjoy the stunning scenery and keep an eye out out for birds, monkeys, and lizards. This morning, drive to Krabi. On arrival, cross the river by private longtail boat past mangrove forests, visiting the Khao Khanab Nam caves to view prehistoric paintings and limestone formations. Later, on Koh Klang, jump in tricycle tuk-tuks to explore local communities and rural industries, including a rubber plantation to see tree tapping, rice fields, and a batik workshop. Learn about the culture and daily life of rural southern Thailand villagers. With our local guide, cross the Krabi River by typical long-tail boat, and jump in tuk tuks to explore local villages and farming communities. Interact with people going about their daily lives farming rice and vegetables and other rural industries. Learn about the culture and beliefs of the mostly Muslim population. 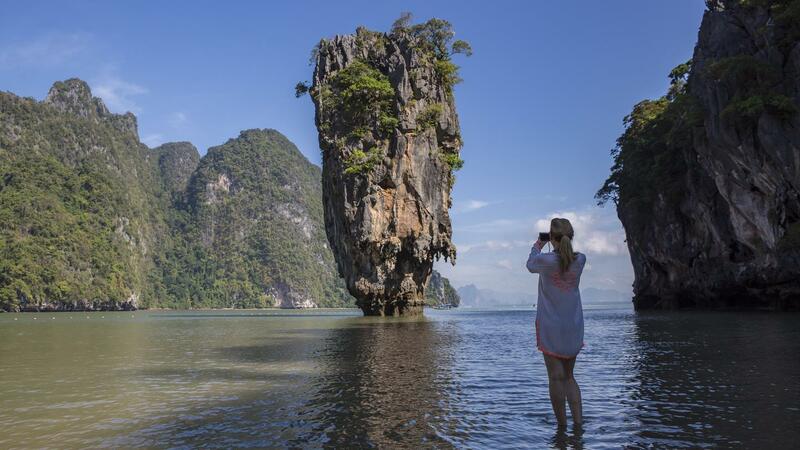 Explore the stunning landscape of Krabi by kayak, a great way to see the caves and wildlife in the area. Relax at a spa, rent a kayak and stay active, or get to know the local marine life while snorkelling. 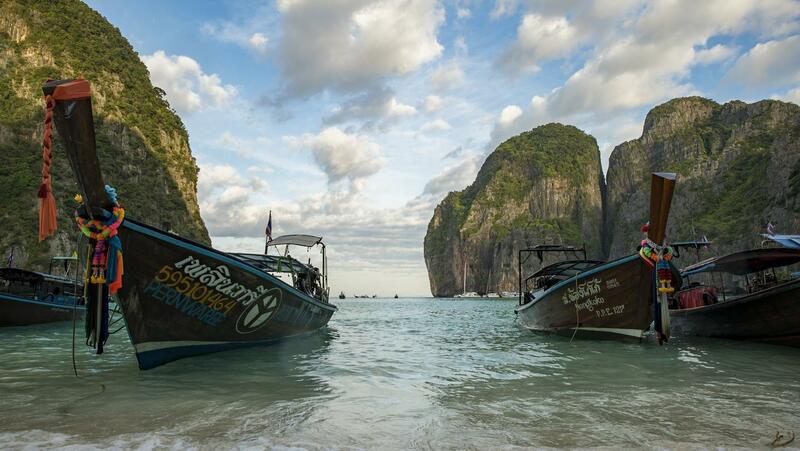 Set off by boat to the Phi Phi Islands for a full-day snorkelling and sightseeing excursion. The Phi Phi Archipelago consists of nine islands. Stop off at the backpacker haven of Phi Phi Don for shopping, exploring, or beach-lounging, and enjoy several stops for snorkelling throughout the day. Clear blue water with coral reefs and marine life await. Enjoy a boat trip to Maya Bay and the surrounding islands, including Monkey Island, where the monkeys have long fangs to crack open crab shells. We then go on to Koh Phi Phi, where the movie "The Beach" was filmed. Get to know the local marine life while snorkelling. Explore the amazing Viking Cave. Today we return to bustling Bangkok. The tour ends at the airport in the mid-to-late afternoon. 7 breakfasts, 1 lunch, 1 dinner. Allow USD110-145 for meals not included. Private bus, minivan, boat, walking, plane. National Geographic Journeys Exclusives: Rainforest Eco-Walk & Dinner, Khao Sok. 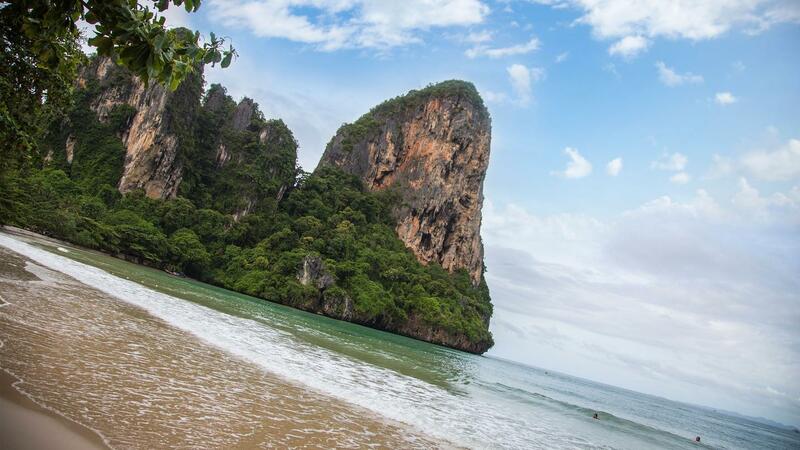 National Geographic Journeys Exclusives: Krabi Village Excursion, Krabi. Arrival transfer. Koh Madsum and Koh Tan Excursion. Kayak trip in Koh Mae Ko. Jungle trek to the green lagoon. Internal flights. All transport between destinations and to/from included activities. Kayak along Koh Mae Ko, Cross Krabi River on a traditional long-tail boat, Explore rural Thailand on tricycle tuk tuks, Relax and enjoy a Thai massage at a spa. This trip ends at the Bangkok airport mid-to-late afternoon on Day 8. Flight times can vary and are always based on availability. Please do not book any flights from Bangkok until after 3PM to ensure you have enough time to catch your forward flight. We also can arrange post-night accommodation in Bangkok - please speak to your agent for details. All G Adventures group trips are accompanied by one of our Chief Experience Officers (CEO). The aim of the CEO is to take the hassle out of your travels and to help you have the best trip possible. They will provide information on the places you are travelling through, offer suggestions for things to do and see, recommend great local eating venues and introduce you to our local friends. While not being guides in the traditional sense you can expect them to have a broad general knowledge of the countries visited on the trip, including historical, cultural, religious and social aspects. We also use local guides where we think more specific knowledge will add to the enjoyment of the places we are visiting- we think it's the best of both worlds. Please note that if you have booked the "My Own Room" option for this tour, you will receive your own single room for all night stops. We don't expect any problems, and nor should you, but if for any reason you are unable to commence your trip as scheduled, as soon as possible please contact your starting point hotel, requesting that you speak to or leave a message for your CEO (if you are not on a group tour please refer to the emergency contact details provided in this dossier). If you are unable to get in touch with your leader, please refer to our emergency contact details. If you have pre-booked an airport transfer please meet your driver at gate number 10 of the airport, in the arrival hall. Look for a driver holding a National Geographic sign with your name. This trip ends at the International airport in Bangkok. If you are departing today, please be sure to book your international flight for late afternoon or evening. Should you wish to stay the night in Bangkok, please ask your sales agent to about booking post night accommodation. What you need to bring depends on the trip you have chosen and the countries or regions you are planning to visit. We suggest that you pack as lightly as possible as your are expected to carry your own luggage. As a rule we try not to have to walk more than 15-20 minutes with your bags which is why we recommend keeping the weight of your bags between 15kg/30lb. We recommended for G Adventures trips a backpack or rolling bag of small to medium size (no XXL ones please!). You will also need a day pack/bag to carry water, cameras and other electronics like ipods and mobile phones. THAILAND - Most nationalities do not need a visa for Thailand for stays of 30 days or less but if you do they are available on arrival at Bangkok Airport. During this tour the local currency you will use is the Thai Baht. As currency exchange rates in South East Asia do fluctuate, we ask that you refer to the following website for the most up to date daily exchange rates: www.xe.com for each of the above mentioned currencies. The best way to carry your money is in debit cards, withdrawing cash in local currencies from ATM machines. ATMs are found throughout South East Asia and will generally accept cards on the Visa and Mastercard networks. It is a great idea to travel with both a Visa and Mastercard if at all possible in case of loss or problems with one card, you will have a back up. Please note, your bank will charge a fee for overseas withdrawals. USD Cash is recommended for times when ATMs are not accessible. You should bring some cash with you for emergency situations (please refer to our trip dossier) but carrying only cash is a high safety risk. ATM card/s and some cash is the ideal mix. Travellers cheques can be tricky, timely and expensive to exchange. While we do not recommend that you bring them as your primary source of funds, it is great to have one or two cheques in case of emergency. Thomas Cook or American Express travellers' cheques in US currency are the easiest to exchange. Cash advances can also be made with some banks but are time consuming and tend to have high fees attached.Credit cards can be used at some upmarket restaurants, and at some larger stores if shopping for big items. If you are bringing US Dollars, please make sure that the notes are new and in good condition. Notes older than 2003, or with any tears or blemishes may not be accepted. Be fussy with your bank when buying cash! Please also make sure you have access to at least an additional USD $250 (or equivalent) as an 'emergency' fund, to be used when circumstances outside our control (ex. a natural disaster) require a change to our planned route. This is a rare occurrence! It is customary in Asia to tip service providers such as waiters, at approximately 10%, depending on the service. Tipping is expected - though not compulsory - and shows an expression of satisfaction with the people who have assisted you on your tour. Although it may not be customary to you, it is of considerable significance to the people who will take care of you during your travels. There are several times during the trip where there is opportunity to tip the local guides or drivers we use. You may do this individually, or your CEO will offer to collect the money and tip as a group. Recommendations for tipping drivers and local guides would range from $1.5-$3.5 USD per person per day depending on the quality and length of the service; ask your CEO for specific recommendations based on the circumstances and culture. Also at the end of each trip if you felt your G Adventures CEO did an outstanding job, tipping is appreciated. The amount is entirely a personal preference, however as a guideline $20-25 USD per person, per week can be used. Optional Activities: USD150-200 for optional activities not included in the trip.